Tucked away on the western tip of Lake Huron sits an island steeped in mystery and lost in time. Known for its status as one of the most beautiful, and historical, tourist destinations in the state of Michigan, the island has a darker side unfamiliar to many of its visitors. When the sun sets and the moon casts a glow across the rocky beaches, the spirits of the dead come crawling through the floorboards of the old hotels to remind everyone of the island’s bloody past. Welcome to Mackinac Island, where the ghosts outnumber the living. Ask any paranormal investigator and they’ll tell you that the cause of a haunting can usually be traced back to something odd occurring in the area. Sometimes it’s a murder or a suicide, often the phenomena is attributed to the makeup of the land itself, and once in awhile, it’s blamed on dark rituals and ancient spirits. When it comes to Mackinac Island, though, you can check off each of those boxes… and several more. The furthest back you can go in the island’s history is about 700 years before white folks arrived and started screwing with everything. Archaeological digs place ancient Native American settlements on the land as far back as 900 A.D., and researchers believe that the island not only served as a prime fishing location, but that the Anishinaabe tribes considered it a sacred place, believing it to be home to the “Great Spirit”. According to their traditional stories, the island was created by the Great Hare, Michabou, and it’s this reason that the tribes would not only trek to the island to make sacrifices to the Gitche Manitou, but designated it was a sacred burial place for their tribal chiefs. Despite the island’s importance to the tribes, Mackinac was mysteriously deserted by the time European explorers discovered it in the mid-1600s. After being settled by the French, the British took control of the island, establishing Fort Mackinac in 1780. Somehow, the Fort Managed to escape any battles in the American Revolution, but was soon handed over to the United States through the Treaty of Paris in 1783. It didn’t last long, because the island was quickly captured by the British during the War of 1812, and stayed that way despite numerous bloody attempts by the American soldiers to recapture it. The back-and-forth game finally came to an end in 1815 thanks to the Treaty of Ghent, putting the island in the hands of the United States ever since. After the Civil War, Mackinac quickly became a popular tourist destination thanks to its natural beauty, and just three years after Yellowstone was designated as the country’s first National Park, Mackinac Island became home to the second. Hotels and restaurants began to pop up in rapid succession to accommodate the influx of vacationers arriving from nearby cities like Detroit, and the rest is history. Today, Mackinac Island looks much like it did back then, thanks in part to ordinances that require landowners to maintain the Victorian look of the buildings on their property, and others that forbid personal vehicles on the island. In fact, you won’t even find a bridge to the mainland on Mackinac, with all visitors instead arriving by ferry or plane. These quirks have culminated in a destination that feels truly frozen in time, so much so that the former residents often refuse to leave long after they’ve died. When you take an island that essentially amounts to a giant Native American burial ground, build a fort on it, kill a whole bunch of people there, then turn it into a tourist destination, you get the setup for a great 80s horror film. Or in this case, you get an island filled with so many ghosts it would be difficult to list them all. But while Mackinac might be teeming with spirits, there are a few that tend to make their presence known a little more often. These ghosts are particularly recognized for not only scaring the bejesus out of visitors, but for pushing investigators to dig up some of the island’s more unsavory events swept under the rug of history. Built in the late 19th century, the Grand Hotel is known for two things: being the setting for the 1980 film “Somewhere in Time” starring Christopher Reeve, and for being haunted as all get out. Legends say that when the construction crew was digging the hotel’s foundation, they began to find so many human skeletons that they lost track of them all. To this day, rumors persist that the workers, increasingly unsure of how to handle the situation, simply gave up on collecting the bones and started building the hotel anyway. The results are as you might predict. One of the spookiest tales to come from the old hotel deals with an “evil entity” in the form of a black mass. As two maintenance men performed a check of the hotel’s theater stage, one of them was struck with the overwhelming feeling that something was watching them, something that he could only describe as evil. As he looked out over the stage, he noticed two glowing red eyes peering from a dark shadow hovering above the theater floor. As he watched in horror, the black form began to rush toward him, knocking him off his feet. Two days later the man awoke in a hospital and swore to never return to the Grand. The stories don’t stop there. Some staff have reported seeing a man in a top hat frequenting the second floor bar’s piano, only to disappear moments later, leaving only the lingering scent of a cigar behind. Others have reported a woman in Victorian clothing that tends to roam the hotel’s employee housing, sometimes even curling up next to workers as they bed down for the night. It goes without saying that locations known for their part in battle are magnets for restless spirits (just look at Gettysburg or the Perrysville Battlefield), but rarely are there as many reports as the ones captured in Fort Mackinac. From apparitions of soldiers glimpsed walking the Rifle Range Trail, to piles of phantom limbs spotted in the Hospital, to furniture that moves on its own, tripping motion detectors in Officer Hills Apartment Quarters, the fort has no shortage of paranormal activity. Not all of the deaths that occurred at Fort Mackinac were those of soldiers, either. At least thirteen children died here, victims of Typhoid Fever, Tuberculosis, and other diseases. Those who have heard the cries of children echo through the halls believe that some of their spirits still reside among the private quarters where they once lived. Even eerier? Those who wake early enough to watch the sun rise can sometimes hear the sounds of a phantom fife player echoing through the fogs near the Fort’s North Sally Port Entrance. Located in the area between the Mission Point Resort and Mackinac’s downtown area is a 20-foot drop off which has long been nicknamed The Drowning Pool. According to local historian and paranormal researcher Todd Clements, it received its name not from the occasional accidental drowning, but from the purposeful torture of women accused of witchcraft. Clements believes that the accused still haunt the Drowning Pool, making one of the scariest – and most dangerous – places on the island. Built in the 1950s as a world conference center for The Moral Re-Alignment, a cultish religious group that aimed to mold the world’s morals to their own liking, the property changed hands a few times until the late 80s, when it officially became the Mission Point Resort. Of all the haunts on Mackinac Island, this one reigns as the most active. 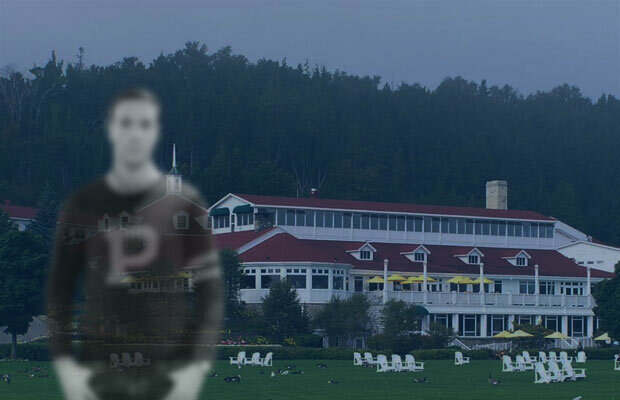 The resort’s most popular ghost is that of a student nicknamed Harvey who died in the late 60s. As the official story goes, Harvey, the victim of a broken heart, made his way to the bluffs behind the resort (then leased to Mackinac College), pulled a gun, and shot himself. His body wasn’t discovered for six months. Clements, who spoke with a state police officer about the case, believes that there was more to Harvey’s story, which might explain why his spirit never left the island. Clements discovered that Harvey died from not one, but two bullets to the head. Adding more fuel to the mystery was the fact that the gun was discovered nowhere near his body. If that doesn’t say “unfinished business”, I don’t know what does. Today, Harvey is often reported lingering in the Mission Point’s theater, where he’s known to pinch and poke young women in the dark. Numerous other spirits are said to inhabit the resort, from ghosts of a young girl heard calling to her parents, to Native American spirits wandering the property, to a woman heard singing old-time music near the theater. The Mission Point Resort is so haunted, in fact, that it drew the attention of SyFy’s Ghost Hunters who filmed an episode there in 2010. One of the stars, Amy Bruni, believes that Mackinac’s hauntings might have a lot to do with how little the island has changed over the years. Despite a looming snowstorm, the Ghost Hunters team managed to capture evidence like phantom voices and footage of chairs moving on their own, but for Bruni, the visit wasn’t enough. 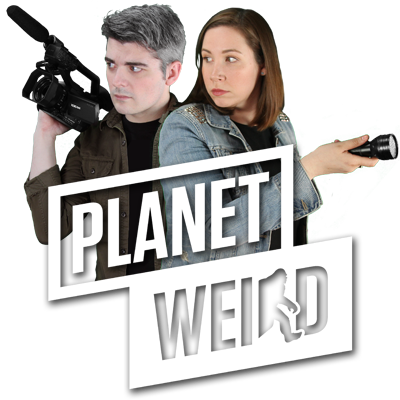 Now she’s headed back to one of the most haunted islands in America, and not only is she bringing some of the world’s most respected paranormal researchers with her, she’s inviting the public to come along. 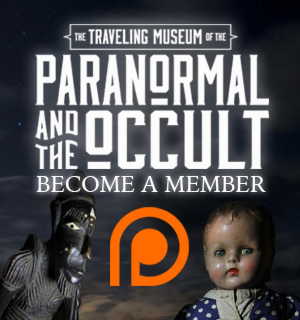 This October, brave guests are invited to spend an entire weekend investigating the island with Bruni as she returns with fellow Ghost Hunters alum Adam Berry, world-renowned psychic Chip Coffey, Ghost Stalkers‘ John E.L. Tenney, and even the curators of the world’s only Traveling Museum of the Paranormal & Occult, to name a few. It’s an event with a high likelihood of spooky activity. Not only will attendees be able to listen in on lectures from some of the paranormal’s finest, they’ll get guided tours of Mackinac’s scariest locales led by Todd Clements, mountains of evidence to peruse, the chance to take part in a classic seance, and the opportunity to participate in a gallery reading with Chip Coffey. 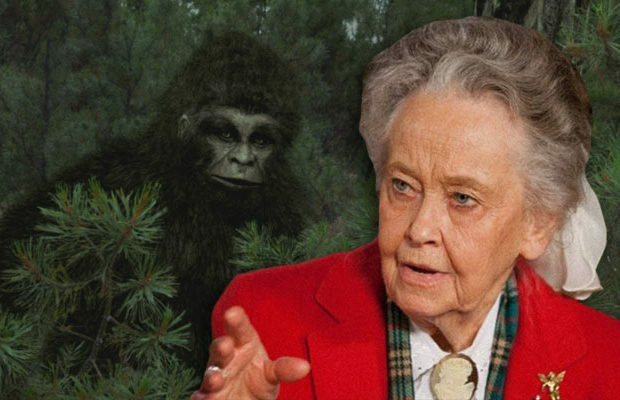 The event culminates in an investigation of the Mission Point Resort, including the sound stage, the theater, the basement, and the Round Island Suite, where Ghost Hunters captured some of their creepiest evidence to date. Never been on a ghost hunt before? Don’t worry, you’ll be in good hands. For more information about Strange Escapes’ Haunted Mackinac Island Event, including dates, ticket prices, and a full celebrity and events list, visit www.strange-escapes.com. PLS tele the black shadow with red dots is a fake pic. Haha, oh totally. That’s just an illustration I made for the post. Maybe I didn’t make it bad enough on purpose. I wish, but our automatic spam control struggles pretty hard as it is. I remove emails and I’ll be slogging through hundreds of DISCOUNT RAY BANS FOR CHEAP! Errr…. we Europeans have been building on burial grounds for thousands of years. We don’t seem to have this problem with vengeful spirits. Why do you Yanks? until this year, I was a wedding photographer for many Mackinac Island weddings. I have been to almost all of the hotels and churches because of this, and I can’t begin to tell you all the unexplainable things I’ve seen. It really is haunted. Well you can’t just leave us hanging like that, Carrie! Spill! Several years ago we were staying at the Murray Hotel on the island. I left my son alone in the room while we took a walk down to Mission point. He was not scared to be alone, and his grandparents were in another room. My daughter got back to the room before I did,I asked if Daniel was ok, she was shook up, Daniel said he was asleep, woke up to find a “pretty woman” sitting on the other bed, smiling at him. He said he wasn’t scared but felt very peaceful. , he said “she didn’t say anything, just smiled, he said he didn’t know if it was a ghost or an angel. She was blonde with pink cheeks. We never forgot that, He still talks about it. Was that Michelle Ann Krizan? I was able to find the article online. September 12, 1989. Ask the locals about hearing the clopping of the dead horses on the cemetery road late at night . I personally have not heard them .however many have . if they will tell you . I am one. One summer at 3am I’d always hear a taxi drive by which was odd for where I moved. I finally jumped out of bed one night as soon as I heard the clip clopping ….nothing…absolutely nothing physical drove by. Great article with historical references, Greg! I can’t get enough of this site. I’m a historian and have been having what would be deemed “supernatural” experiences since I was about 4 years old. I’m in my late 40’s now. I will never get tired of hearing of other’s experiences and active historical areas. Watched your Mission Point investigation. Very interesting. My experience happened at the Grand Hotel, and Goodfellows restaurant. My son took me to Grand Hotel for Mother’s day. The first night we did some ghost hunting….felt a very cold spot on the forth floor, and got alot of pictures with orbs. One you can see a woman’s face in. Another time on the Island my husband & I went to Goodfellows restaurant for lunch. I bought a book on Mackinaws haunting s. I was telling him about ghost’s & he told me to look. while I recited events to him, the ashtray on our table slid by itself to the otherside. He tried to wiggle the table, and check for moisture to debunk what had happened. But the table was dry and didn’t move( the table was very steady). We went there again to check out our table a few years latter and they had remodeled the place. There is no such thing as the drowning pool. Total fabrication! I have an association of more than 40 years with the island – lived there, worked there, vacationed there. You made that up! Please don’t deny it. Everyone in the know is on to you. Did you happen to read the newspaper during your 40 year association with the island? Or were you too busy picking fights on the internet? I really enjoyed this story , interesting!